The fourth book in the Atria Books/Beyond Words Library of Hidden Knowledge, a modernized version of one of the first works to make the Law of Attraction accessible to the general public: timeless guidance on the power of prosperity, intuition, relationships, and other perennial topics. The game of life is a game of boomerangs. Our thoughts, deeds, and words return to us sooner or later with astounding accuracy. Florence Scovel Shinn, a prominent and provocative twentieth-century leader of the New Thought movement, was known for her sage guidance on prosperity, intuition, relationships, and fulfillment. Shinn’s distinct philosophy and practical approach included enlightening affirmations, timeless anecdotes, and action-based advice that are still relevant for the fast-paced world of today. In addition to Shinn’s original writings, The New Game of Life features Dr. Ruth L. Miller’s contemporary translations as well as additional exercises and summaries to fully engage a new generation of thinkers. Most people consider life a battle, but it is not a battle, it is a game. New Thought leader Florence Scovel Shinn’s The Game of Life and How to Play It, was originally published in 1925 and still stands today as one of the earliest and most accessible introductions to the Law of Attraction, the backbone of the bestselling book and movie The Secret. Now, Dr. Ruth L. Miller, New Thought minister and series editor of the Library of Hidden Knowledge, takes you to the very heart of Shinn’s original wisdom through insightful modern interpretations. With incredible vision, moving stories, and accessible “game” plans for success, The New Game of Life and How to Play It deftly guides you toward a life of prosperity and fulfillment. This reading group guide for The NEW Game of Life and How to Play It includes an introduction, discussion questions and ideas for enhancing your book club. The suggested questions are intended to help your reading group find new and interesting angles and topics for your discussion. We hope that these ideas will enrich your conversation and increase your enjoyment of the book. 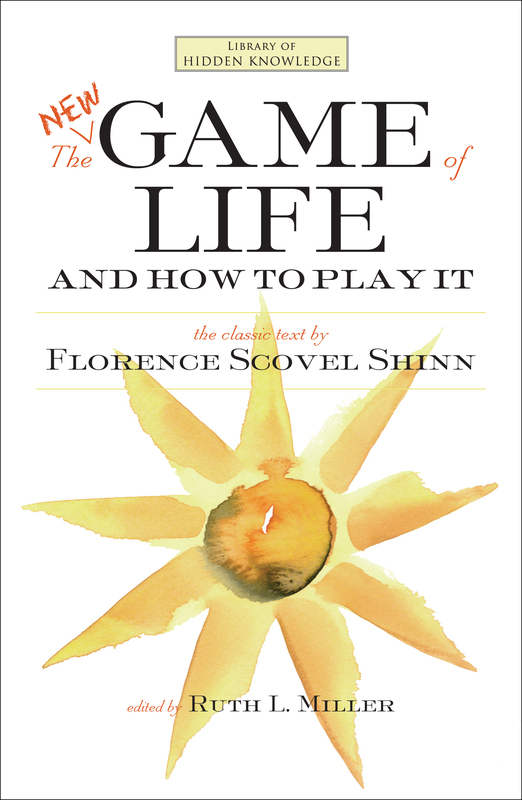 The Game of Life is the work of Florence Scovel Shinn, an artist who found a way to transform her own life and the lives of the people around her. Dr. Ruth Miller has brought this 1925 transformational classic into the modern world by providing modern examples and language, and showing how the world’s spiritual traditions and 21st century science support Shinn’s ideas. 1. The opening lines of this book say that life is not a battle but a game. How do you see life? Do your ideas about life include winners and losers? Do they include fighting for survival? Do you think about life as a classroom? If so, are the lessons challenging and difficult, or fun and enjoyable? What do you think of when you think of a game? Football? Chess? How is your life like the games you think about? 2. “Speak the word” is the fundamental method in this book. What does it mean to you? This is in the Bible; who said it and why? What were the results? Why would it work for us? 3. Several of the stories in this book are about people who needed a certain amount of money at a certain time and, by practicing the principles and methods, had it arrive just in time. Has anything like that ever happened to you? Is there something in your life you’d like to have work that way now? If so, how would you apply Shinn’s method to your situation? 4. A couple of the stories are about women who were unhappy in their relationship. But Shinn doesn’t tell them how to change their partner—she says they must change themselves, and shows them how. Do you have a relationship that isn’t as wonderful as you’d like it to be? How could you apply Shinn’s method to make that work better for you? 5. Two of the stories in the book talk about what happens when we forget to focus on the best good for everyone involved. In one of them, a child who pretends to be a widow is widowed very early in her marriage. In another, a woman who insists on a particular house gets it at a very high cost to all involved. How can we be sure to claim and “speak the word” in a way that works for everyone? 6. Both the Buddha and Christ tell us that our life is shaped by our thoughts, words, and beliefs. What are some examples that you’ve seen in scripture and in your life? 7. Much of the first chapter deals with how we have many old ideas and subconscious “programs” that no longer serve us and need to be deleted. What might some of those “programs” and beliefs be? If it’s hard to think of any, think of the things in your life that aren’t working well. What beliefs, ideas, assumptions, or internal “programs” might be contributing to those experiences? 8. Fear is the theme of a couple of the stories. In one, the woman who went back and faced her fear found that it had disappeared. Have you ever had that experience? How did it feel? Therapists say that if we’re being chased in a dream and turn around to face it, the thing or person chasing us will disappear or be transformed. Has that happened to you or someone you know? What was it like? What fear could you face and dissolve now? 9. If you play videogames, you know about levels and clues and persistence. How is Shinn’s model of life like a videogame? How does thinking about life that way make it easier to go ahead and try things? 10. In the last part of the “interpretations” section, Dr. Miller explains some of the scientific theories and experiments that support Shinn’s ideas. Take a look at each one. Do they make sense to you? If not, where could you go to find out more about them? If so, do you have a story or image that you can use to help someone else understand them? 1. Watch the DVD What The Bleep Do We Know? and see how Amanda’s thoughts and words have contributed to her experience. Then, see how her life changes when her thoughts and words change. Talk about the segment on “addictions”, when Amanda is at the wedding reception, as an example of how the “programming” and “reprogramming” that Shinn is describing works. 2. Danny DeVito’s character in the film Renaissance Man also changes his thinking and focus, and transforms not only his life but the lives of many others. See if you can track the point at which his selfish thoughts and words are turned around. What makes the difference? How could we have a similar shift? 3. Set up a 28-day challenge for the group. Have each member report each time you meet on their progress in changing their “programming” by repeating the words in the exercise at the end of Chapter 1 or 3. 4. Have someone who knows how to play Kingdom Hearts (a Disney product in which the player moves through different Disney “kingdoms”) demonstrate it to the group. Imagine the dark force is our own shadow self and the little black things that have to be eliminated are our own dark thoughts. How does that affect how you play the game? 5. While the group is gathering and during breaks, play CDs with some of the songs and chants by various Positive Music Award winners, like Karen Drucker’s “I Am So Blessed,” Daniel Nahmod’s “More Than Enough,” Devotion’s “Intention,” or Karen Taylor-Good’s “I Always Know What I Need to Know When I Need to Know It.” You can find them on the artists’ websites or at www.empowerma.com. "Ruth Miller’s unique writing approach helped me see how far I had come in putting my beliefs into reality. The book’s play of before and after, from original ways of thinking to today’s awareness, gave me proof that learning to manifest life choices isn’t a new game. The New Game of Life and How to Play It was an insightful way to measure my journey as growth." "The New Game of Life and How To Play It is the quintessential text explaining in contemporary language the spiritual laws of abundance, attraction, and manifestation. For me, this book personifies the Living Word, a wonderful melding of teachings from the Bible, the Koran, the Gita and current day New Thought spirituality, all addressing the same subject: abundance and how it is available to all for the asking."